In Connecticut and throughout much of New England, home and business owners have come to depend on fuel oil to provide whole-house heat as well as hot water. Oil furnaces, oil boilers and oil-fired hot water heaters are probably more prevalent here in the Northeast than just about anywhere else in the country. While fuel oil dealers and HVAC contractors do most of the service work on oil-burning equipment, they’re not well-equipped to deal with certain oil-related problems like oil spills, soot stains and furnace puff-backs. When these problems occur, ServiceMaster of Greater Bridgeport, CT can provide expert cleanup services quickly and affordably. An oil spill and a furnace puff-back both qualify as major accidents that should be cleaned up as quickly as possible. Spilled oil is an environmental as well as a fire hazard. A furnace puff-back can put sooty, oily deposits on walls, ceilings, floors and furnishings throughout the house, forcing homeowners to vacate the property until cleanup work is completed. Recognizing the urgency of these mishaps, ServiceMaster of Greater Bridgeport, CT offers emergency cleanup and restoration services on a round-the-clock basis. Our service technicians are professionally trained to handle small-scale oil spills safely and effectively. 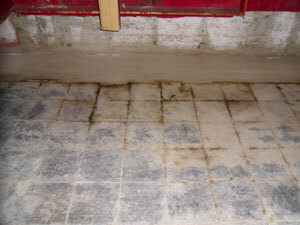 They can remove soot deposits and provide thorough cleanup after furnace puff-backs. Odor removal is also one of our services. We have the expertise and the equipment to deal with property damage in ways that maximize cleaning effectiveness while minimizing further damage to walls, ceilings, furnishings and other building contents. Following an accident, ServiceMaster of Greater Bridgeport, CT can work directly with home and business owners, contractors and insurance companies. We don’t begin cleanup operations until we’ve provided our customers with a thorough assessment of the damage and an estimate for completing cleanup operations. Service Master Greater Bridgeport provides services for Connecticut home and business owners in and around Bridgeport, Stratford, Norwalk, Fairfield, Monroe, Trumbull, Danbury, Shelton, Bethel, Seymour, Brookfield, Orange.